Two areas in West Gloucestershire and West Somerset have been selected as the most suitable to pilot controlled shooting of badgers. Landowners and farmers from two carefully-selected areas are now able to apply for licences to pilot new measures designed to tackle the devastating impact of bovine TB, Agriculture Minister Jim Paice has confirmed. The disease forced the slaughter of 25,000 cattle in 2010 alone and will cost taxpayers around £1 billion over the next ten years if not effectively dealt with. Two areas in West Gloucestershire and West Somerset have been selected, from a shortlist proposed by the farming industry, as the most suitable to pilot controlled shooting of badgers. This forms part of a science-led and closely monitored policy to bring bovine TB under control. “Bovine TB is a chronic and devastating disease. It causes the slaughter of tens of thousands of cattle each year, and is taking a terrible toll on our farmers and rural communities. “Nobody wants to cull badgers. But no country in the world where wildlife carries TB has eradicated the disease in cattle without tackling it in wildlife too. “These two pilots are just part of a wide range of activity on bovine TB. We already have robust measures to control its spread amongst cattle, which we plan to strengthen further, and are continuing to work hard on the development of practical and usable vaccines. The pilots will allow the careful examination of how safe, humane and effective controlled shooting is and were announced, after public consultation on better tackling bovine TB, in December last year. Farmers and landowners in these areas are now able to apply to Natural England as a group for a licence to take part. Their applications will then be assessed against strict criteria before a decision is taken on whether to issue a licence. Participants must take reasonable measures to mitigate the risk of badgers with TB relocating or spreading bovine TB to areas surrounding the culled area. These could include natural barriers that help stop the movement of badgers - like coastline, rivers and major roads - or vaccination of badgers in the surrounding areas before the pilots begin. Jim Paice also stated that the Chair of the independent panel of experts will be Professor Christopher Wathes, who will have the important role of overseeing the monitoring and evaluation of the pilot areas. Professor Wathes is a Professor of Animal Welfare at the Royal Veterinary College and the current chair of the Farm Animal Welfare Committee (FAWC). Other panel members will be appointed shortly. Pilots will take place over a period of 6 weeks and are expected to begin in early Autumn. The independent panel of experts will oversee and advise on the monitoring of the safety, humaneness and effectiveness of controlled shooting. The group will then report back to Government. Professor Christopher Wathes, holds the Chair of Animal Welfare at the Royal Veterinary College, University of London. He is a research scientist with interests in the environmental biology and management of farm and other animals. Further biography may be found on http://www.rvc.ac.uk/Staff/cmwathes.cfm. Licences will be issued by Natural England under the Protection of Badgers Act 1992. Further information on the application process can be found on Natural England’s website at http://www.naturalengland.org.uk/ourwork/regulation/wildlife/species/btbbadger.aspx. Following public consultation, in July 2011 we announced the Government’s Bovine TB Eradication Programme for England. 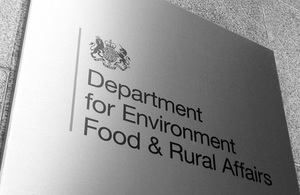 On 14 December 2011 we confirmed two pilots would be held, details at http://www.defra.gov.uk/animal-diseases/a-z/bovine-tb/. Research into how bovine TB is spread, and the continuing development of oral badger and cattle vaccines. Animal disease control is a devolved matter, and this announcement relates to bovine TB disease control in England only. The Randomised Badger Culling Trial (RBCT) took place between 1998 and 2007, and showed that badger control done on a sufficient scale in a co-ordinated and efficient way and over a sustained period of time reduces the incidence of bovine TB in cattle in high incidence areas. At a meeting between Defra’s Chief Scientist and scientific experts, participants concluded that if culling is conducted in line with the strict criteria identified from the RBCT, we would expect it to reduce TB in cattle over a 150 km2 area, plus a 2km surrounding ring, by an average of 16 per cent over nine years. This is an estimate based on the RBCT and what is actually seen will be affected by things such as the size of the area, the amount of disease in cattle and badgers and how many badgers are removed. http://archive.defra.gov.uk/foodfarm/farmanimal/diseases/atoz/tb/documents/bovinetb-scientificexperts-110404.pdf. The RBCT provided evidence that culling causes changes to badger social organisation and behaviour, called perturbation. The “perturbation effect” is the rise in TB in cattle in a 2km ring outside the culled area, hypothesised to be the result of increased contact with perturbed infectious badgers. In the RBCT, this effect disappeared 12-18 months after culling stopped. The benefit seen in the culled area, taken together with the initial rise in TB cases observed on unculled adjacent land (the so-called ‘perturbation effect’), resulted in a significant net reduction in the overall number of new TB cases. The Government remains committed to research into a cattle vaccine and an oral badger vaccine, with the goal of having these vaccines licensed, available and widely used in the field. We are investing in further research, which will also be used to press the case in Europe for changes to EU legislation to enable cattle vaccination. Currently the injectable badger vaccine developed by the Government is the only vaccine available. It is costly and can only be administered by vets or trained lay vaccinators but could still have a valuable part to play as part of a package of measures to tackle TB. Defra, the National Trust, Wildlife Trusts, Badger Trust and National Farmers Union are all engaged in small-scale vaccination projects. Details of the Defra funding which will be made available to support and encourage badger vaccination can be found at www.defra.gov.uk/animal-diseases/a-z/bovine-tb/vaccination/. Following the badger culling pilots, if we decide to proceed with this approach, a maximum of ten culling licences will be granted to start each year.